Take the creation of single and multilane roundabouts to another level of productivity with full control and feedback during the roundabout design process. Designing optimal roundabouts that meet traffic operations and safety objectives has never been easier. Powered by the trusted AutoTURN engine, TORUS uses the patent pending Vehicle Envelope Method® of design to generate roundabout geometry with vehicle swept paths. This innovative approach allows for real-time, interactive designing and dynamically updates any changes made to the entire roundabout layout. Engineers with all levels of roundabout design experience will find TORUS invaluable for projects throughout the feasibility, preliminary, and planning stages. TORUS is the most advanced and innovative roundabout design software on the market. TORUS was developed over a course of 2 years by Transoft Solutions’ team of engineers working tightly with our software developers. Meticulous research went into the planning of TORUS involving both GPS field studies to support the algorithm development and continuous software testing to ensure quality and performance. TORUS delivers a truly unique, time-saving, and productivity accelerating approach to designing roundabouts. Incorporating the AutoTURN engine, TORUS uses vehicle swept path movements and speed as the design criteria. TORUS ‘drives’ the vehicles through the roundabout (applying the design guidelines for each major geometric element) to determine the layout as opposed to conventional manual methods where the design is first drawn and then checked using vehicle templates. 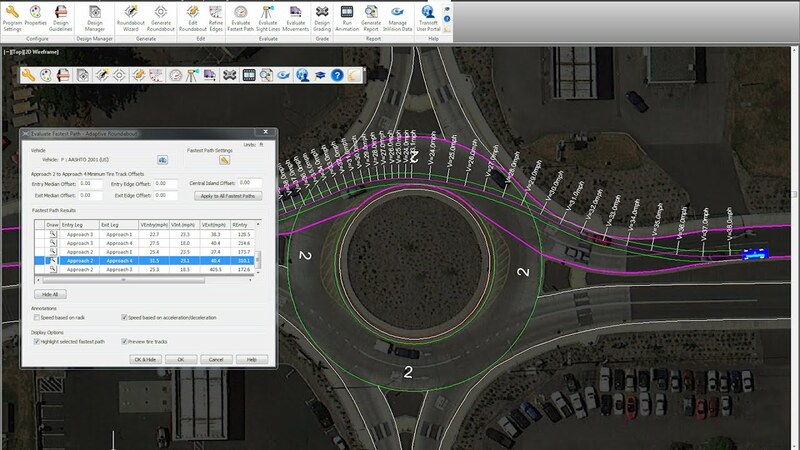 The new TORUS Roundabouts 5.0 release from Transoft Solutions takes the evolution of this software to another level with new features for designing turbo roundabouts and checking vehicle paths and fastest paths on circular or non-circular roundabouts. This new version represents the most sophisticated roundabout design software available in the industry. Designing roundabouts that meet traffic operations, site constraints and safety performance measures has never been easier. Would you like some personal advice or further information about TORUS? High-quality traffic engineering design applications. AutoTURN Lite provides cost conscious urban engineers and architects a simple and reliable option for performing vehicle simulations in the design of carriageways, loading bays, car parks, and driveways. Dynamic CAD Software for Designing Complete Parking Sites.